I went to Sonic tonight with my girlfriend, and on the way out I decided to grab a random drink that I've never had before. So I went with an Apple Limeaid. It was a mistake. Well, the main mistake was getting a large. This drink was so sweet and so acidic (from both the limes and the apples) that finishing the cup was a chore. It was good. The first drink was amazing. But after a few more sips, it was overwhelming. 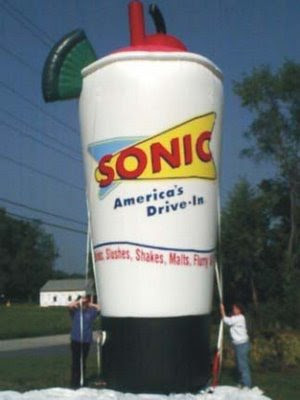 It's not a bad thing to try, but there are much better beverages from Sonic on which to spend your money. Verdict: Get something else. If you really must try it, get a small. Hell, even a kid's cup would be enough.